Services ~ OM PLASTIC INDUSTRIES PVT. LTD.
Full in-house lines with injection moulding machines, consisting of latest PLC/Robotics controlled machines in varying capacities.Om Plastic undertakes everything in Injection Moulding work. We are producing various plastic moulded components for Automotive manufacturers, Surgical Scalpel, Electrical & Electronic accessories. The set-up data for the part is stored electronically which ensures that components are consistent for every batch. Finished parts are packaged and supplied with full traceability. Flexible assembly line for various components. Various assembly processes are offered. Om Plastic Industries offers the buyers a comprehensive range of customized rubber parts, metal to rubber bonded components and molded rubber components that match the strict quality requirements of international market.Moreover, it also manufactures and exports a wide variety of rubber bonded to metal parts, rubber sealing rings, rubber O rings, rubber grommets, rubber gaskets, rubber washers and other customized rubber components as per clients requirements. We are well known for Rubber Parts Manufacturer, Rubber Products Exporters and Rubber Gaskets Manufacturer in India. We have a well-equipped production unit, which is backed by hi-tech machines and cutting edge technology. 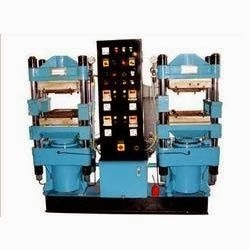 We also process state-of-the-art machines including Kneaders, Mixing Mills, Hydraulic presses etc. We have well-equipped, in house, laboratory for the testing of Tensile, Elongation, Compression, Volume, Specific Gravity, Ash contents, Hardness, Heat & Oil Resistance etc. The fact that we are the sole sources to major customers puts an additional responsibility on us. We believe that it is the absolute right of the customers to expect prompt services and consistent quality. We advocate Just In Time (JIT) concept for uninterrupted supplies at competitive prices. This philosophy of our company manifests itself in every facet of the organization.Our quality control and development department ensures full customer satisfaction by manufacturing high quality products of rubber parts through strict quality inspections.